Making quick work at the grocery store with OmniFocus and Apple Watch. I’m not sure what it says about my productivity, but the number one thing I use OmniFocus for is grocery shopping. I’ve been using it this way for years, but with the addition of the Apple Watch, I can get in and out of the grocery store in no time at all. Allow me to explain. When you read about uses for OmniFocus (as I’m wont to do) you sometimes hear that very specific tasks are best left to other niche applications. Grocery shopping comes up a lot as something worth moving off to another app. Jeffrey Abbot over at The Sweet Setup has a great rundown of grocery list apps, but I prefer OmniFocus, mostly because it’s where all my other stuff is. I like to live in OmniFocus when it comes to productivity, so any excuse to put more information in it is good for me. If I only put my big boy tasks (work, responsibilities, etc.) in there, I’d probably never want to launch it. When I open OmniFocus to manage my groceries, it reminds me that I have other things to do. Some of these steps will only need to be done once, and some can be automated on a Mac. More on that below. The “Grocery Store” context is the end point for our grocery list, the view we’ll be looking at while we shop. Create a single action project called “Grocery Shopping.” This is where we’re going to organize what we’re going to buy. Make the default context “Grocery Store” so that anything you create within the project will show up in the “Grocery Store” context. One of my favorite OmniFocus features is the ability to create a task within another task. This helps me focus on one aspect of a project at a time. For our “Grocery Shopping” project we’re going to first create a task for each aisle at the store. Each grocery will then be created within those aisles. Once you have this bare project set up, you can begin putting your grocery items in order. On a Mac, if you already have some items in your database, you can drag them to your “Grocery Shopping project, then to the appropriate aisle. You may still need to set the context to “Grocery Store.” On your iPhone or iPad, as you create items, you can “Move” them into the appropriate aisles. If there are aisles that don’t have any items in them, delete them. When we go to our Grocery Store context, we should see only the grocery items we want to buy in aisle order but not the aisle names. This is another nifty OmniFocus feature we’re going to use to our advantage. In context view, you won’t see the name of the aisle until you check off every last item in it. What’s nice about this is it’s a way of telling you to move on to the next part of the store. You’re done in produce, onto the deli counter! 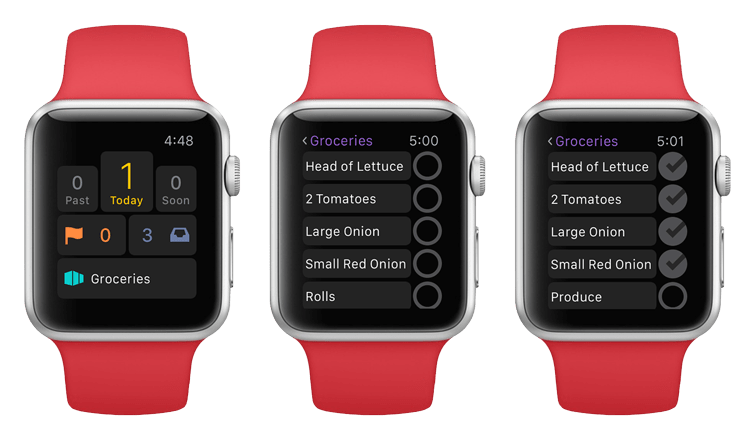 If you have an Apple Watch, you can access your list by going to the “Grocery Shopping” context on your phone, which will then be available on the watch. 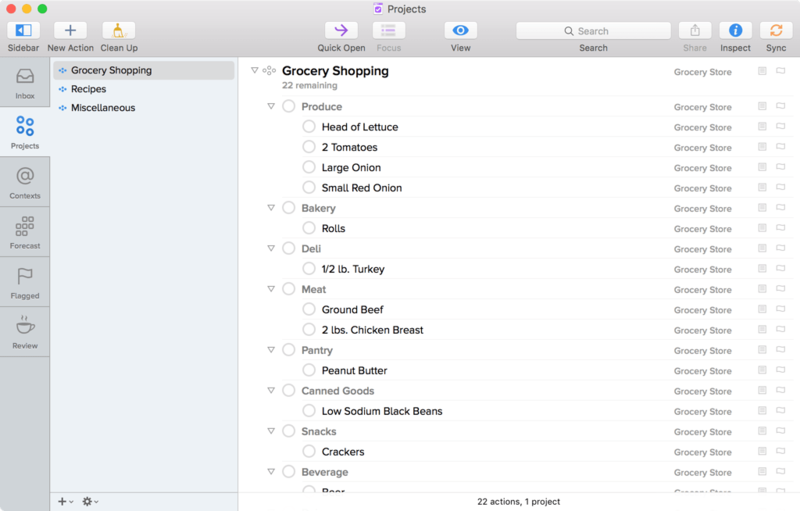 If you have OmniFocus Pro, you can create a Perspective for the “Grocery Shopping” context, which you can then put right on the first screen on your iPhone. With watchOS 2 and the latest version of OmniFocus, I’m able to keep a shortcut to OmniFocus right on my Apple Watch face. When I’m at the store, I tap it to take me to my grocery list. If enough time elapses that my watch reverts to showing the time, OmniFocus and my groceries are just one tap away. Okay so that may seem like a lot of steps, but I automate a lot of the process on my Mac. I use Chris Suave’s “Templates.scpt” to quickly duplicate my “Grocery Shopping” project. I have found that it helps to create blank placeholders within each aisle, which takes out a step of making sub-actions later. I also wrote an Applescript to get ingredients from common recipe sites on the web into OmniFocus. How and why I use this jiggery pokery is another article altogether, but I’ll offer this: if you’re not sure what to get at the store, picking out some tasty recipes is a good place to start. Even without resorting to Applescript, you can easily copy and paste ingredients from into OmniFocus on either a Mac or on iOS. Once they’re in OmniFocus, you can move them into your shopping list. As I mentioned above, there are other apps tailored to this particular task, but none have ever worked as well for me as OmniFocus. Efficiency is antithetical to the layout of a grocery store. They want you to wander and buy all sorts of stuff you don’t need. One store near me nefariously put the beer next to the frozen pizzas; evil geniuses. It’s thus incumbent on us, responsible shoppers who would never buy a superfluous thin crust, to make the process simpler. OmniFocus makes that happen for me. Ticking off grocery items on my watch as I traverse the grocery store feels great. My phone can stay in my pocket while I try to figure out where they keep the tahini. 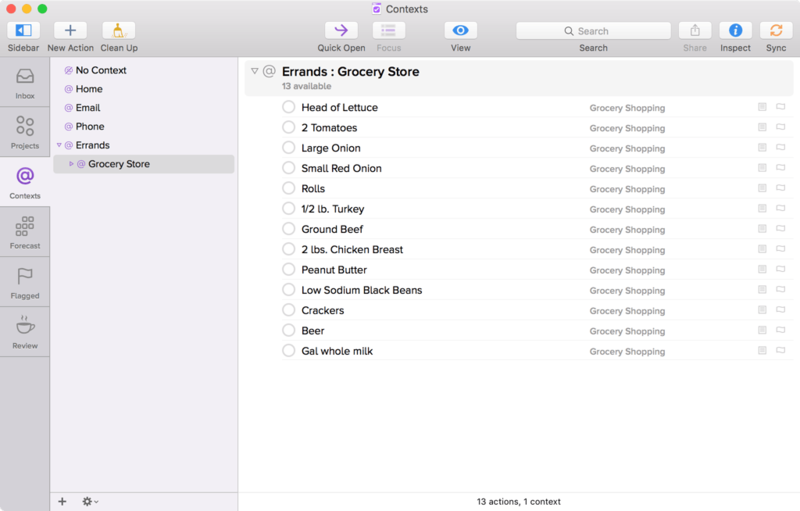 Shopping for groceries with OmniFocus can be easy, painless and even fun. The hard part should just be chopping the onions and getting a stew going. Actually that sounds pretty good…be right back. Jonathan Poritsky writes the candler blog and contributes elsewhere. He’s into cinema, technology, and things like this. You can probably find him on Twitter right now.